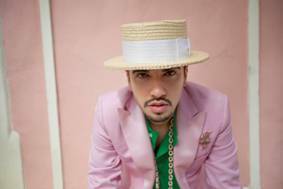 DJ Cassidy has premiered an exclusive remix of his debut single “Calling All Hearts” featuring Robin Thicke & Jessie J via Billboard CODE. The remix was produced by Shermanology, three siblings from The Netherlands best known for their work with Afrojack (“Can’t Stop Me”), Avicii (“Blessed”), and Martin Garrix (“Can’t You See”). PRESS HERE to listen now. “Using some of the song’s original instrumentation and arrangements from Earth, Wind & Fire, Nile Rodgers, John “JR” Robinson, and Jerry Hey, Shermanology executed the union of live and electronic musicianship in true anthemic fashion, calling all worlds of dance music to the dance floor in one shot,” proclaims DJ Cassidy. To evoke what he calls the “golden era of dance music” on his debut album, Paradise Royale, Cassidy reunited twenty-two of the most legendary musicians of the late 1970s and early 1980s for the first time in over thirty years to capture the sound of their prolific era using no covers, no samples, no interpolations, and no machines. The iconic list of musicians includes Philip Bailey, Verdine White, and Larry Dunn of Earth, Wind & Fire, Kool & The Gang, John “JR” Robinson and Bobby Watson of Rufus, Patrice Rushen, Ray Parker Jr, Nile Rodgers of Chic, and many more. Cassidy then recruited thirteen of the most revered and diverse recording artists from his own era to write and record original songs. The astounding list of artists includes Robin Thicke, Jessie J, R. Kelly, Mary J. Blige, Passion Pit, CeeLo Green, John Legend, Estelle, Chromeo, Ne-Yo, Kelly Rowland, Melanie Fiona, and Usher. The result is an epic opus of celebration whose inescapable rhythm and explosive spirit moves everybody within its reach. “Producing this album, I set out on a mission to bring the greatest and most universal dance music of all time back to the airwaves, back to nightlife, back to the dance floor,” says Cassidy. Paradise Royale is set for release in Summer 2014 on Columbia Records.